HR-V Stands For Hi-rider Revolutionary Vehicle. 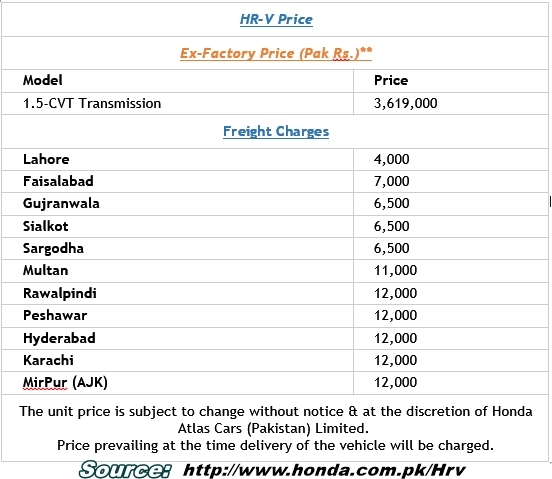 Honda Pakistan brings another heart touching Car for its trendy customers Honda HR-V is Elegantly Sporty Car i.e. combination of luxury and comfort or called it SUV (Sport utility vehicle). HR-V is equipped with latest luxury comforts of finest leather and fabric with HDMI and UBS ports which will connects on the way and also add push-button for hand brake its an extra ordinary feature. HR-V design is very attracting for young generations because its design is a combination of Shark fin Antenna on the top, Electronically Adjustment Mirrors, Elegantly Designed Headlights, Chrome Door handles, Stylish Hidden Rear Door Handle.